Stuart had a remarkable beginning. 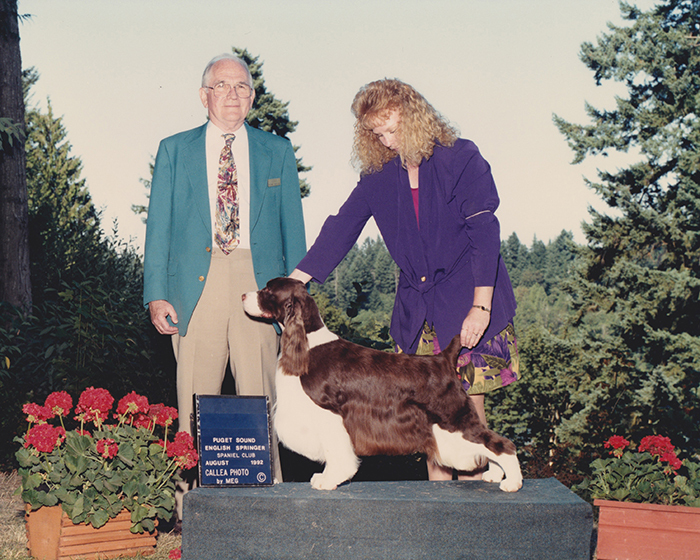 His first appearances in the show ring in the 6-9 puppy class earned him three BOW’s and three majors. Next, from the 9-12 class at the ESSCM Spring Specialty, he was awarded Best in Sweeps and BOW for his fourth major. He finished his championship by going BOS over five of the breed’s top specials at the Chicago International. He was also awarded Best in Futurity at the June 1984 Eastern Specialty. Stuart was an exciting specials dog. 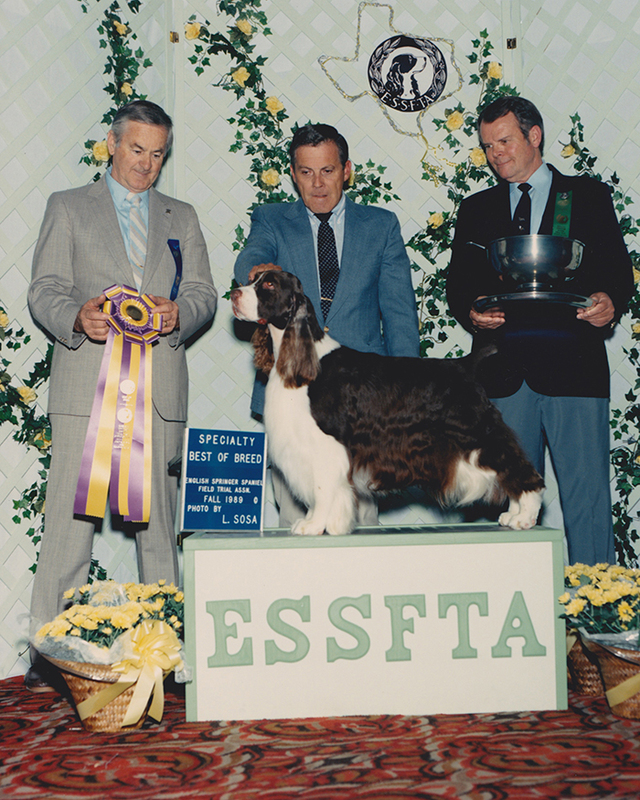 He won 67 Best in Shows, setting a record for springers at that time. He also won three national specialties, including one from the veteran class in 1990. To our knowledge, Author and Stuart are the only father/son to win BOB at the national from the veteran class. 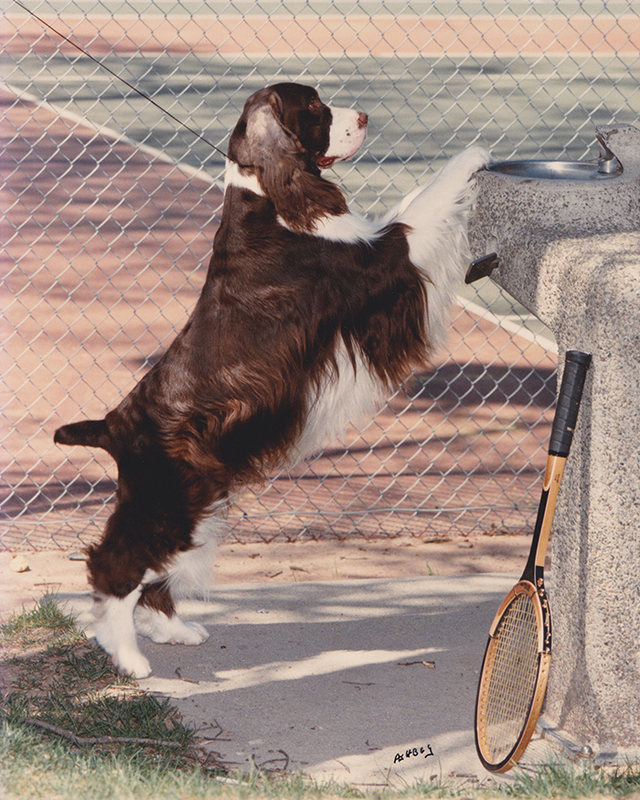 In 1986, Stuart won the Quaker Oats Award for the Top Sporting Dog. Stuart was also Sire of the Year for Parent Club for three years, producing over 100 champions. Some of his more well-known champion get include CH Silverhill’s Straight Up, CH Gilchrist Tomahawk, CH Brendan’s Royal Command and CH Brendan’s Royal Carriage, CH Kawin’s Moment of Glory, CH Alpine’s Royal Park, CH Tellale Refrain, and CH Telltale Scruples.